Over the past 10 years significant improvements have been made to the budget accommodation available to travellers in Sarajevo. With both modern hotels standing alongside traditional Bosnian home stays and pensions, travellers will have no trouble finding somewhere comfortable to rest and at a decent price too! If you’re researching budget accommodation in Sarajevo you first need to determine the amount you’re willing to spend. It may be that what you’re willing to spend on hostel in neighboring Croatia, will get you a fairly decent mid-range hotel in Sarajevo. As a benchmark, you can be looking at EUR 15 for the very basic up to around EUR 45 for something very nice and comfortable. You want to also consider that food and transport in Sarajevo is fairly cheap and so spending a bit more on accommodation might not be such a bad thing. Lonely Planet hasn’t reviewed too many hotels in Sarajevo. It’s a shame because Sarajevo is such an incredible place to visit and should really be on every travellers ‘must see’ list. Fortunately, the guys and girls at Greenvisions have partnered with whl.travel to create the travel site, Sarajevo-Travel.ba. 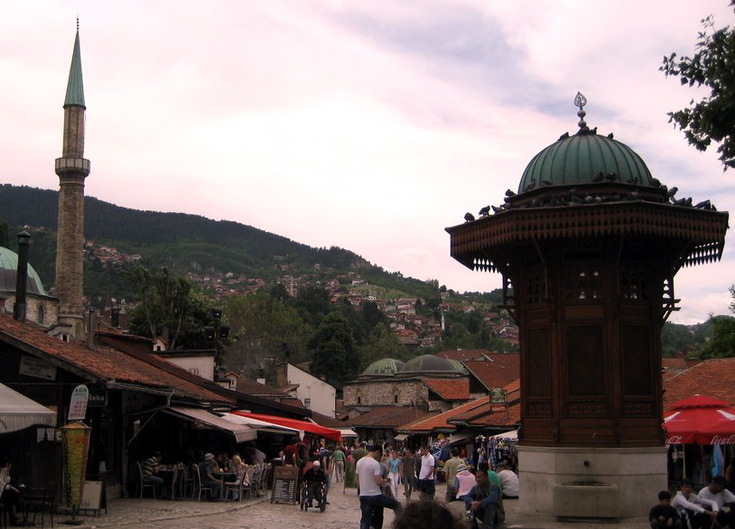 As the local connection in Sarajevo, Thierry and his team have been able to bring together many interesting and unique budget accommodations in Sarajevo that you would not otherwise find online or would have difficulties booking online. whl.travel operates with this model in over 100 destinations around the world, giving you a local connection as you travel the globe. If you would like a few suggestions as to budget accommodations in Sarajevo, try Hostel City Centre. A fairly standard hostel with cheap rooms and basic amenities. Another idea would be Ljubicica, another fairly basic hostel with a great bar/cafe/internet social area. Whilst the main hostel is located quite close to the pigeon square (you’ll know this square like your own backyard after your visit! ), most of the accommodation is provided through private apartments operated by local families allowing you to experience true Bosnian life and some friendly conversations. If you are prepared to spend a bit more, try Guest house Halvat, operated by the friendly Valida and Mumo in Sarajevo’s Old Town. As hotel operators during the war they have plenty of tales to tell as well as serving up a delicious home-made raspberry jam with breakfast! One of the best accommodations in Sarajevo though has to be Pansion Kandilj, a small family run establishment committed to responsible tourism in their country. Pansion Kandilj provides their guests with a genuine experience with the facilities all designed in traditional Bosnian-style. They also promote the local culture offering guests with handicrafts and traditional clothing. If you decide to stay at Pansion Kandilj be sure to indulge in the delicious breakfast they will cook you on request (all included of course – try the bacon and tomato omelets!). If you would like any other recommendations or advice regarding budget accommodation in Sarajevo please contact our local Sarajevo team. Please comment if you know of any other great little budget accommodations in Sarajevo that deserve a mention! Will visit this mentioned travel website because i’m planning a holiday to Sarajevo this summer. I want to stay in a budget hotel so Pansion Kandilj looks interesting!